BLOG AWARDS - Thank You! Are you embarrassed to show your teeth when smiling? Would you like to try a teeth whitening system that will give you beautiful, naturally white teeth with the same system used by your dentist? If yes, you will love Smile Brilliant! This custom-fitted teeth whitening system is handcrafted by dental lab technicians and designed to give you the best teeth whitening experience – from the comfort of your home. Since they are identical to what most dental offices use, using Smile Brilliant could save you up to 70% off what you pay at the dentist. Better yet, it is risk-free and allows you to get your money back if you aren’t happy – they are that confident you’ll love the results! To learn more, make sure to check out what Budget Earth thinks of it here: Smile Brilliant Teeth Whitening System. Now that you know a bit more about this terrific custom-fitted teeth whitening system, Are you ready for a chance to try this teeth whitening system for yourself? Budget Earth and some of their favorite bloggers are excited to be working with Smile Brilliant on this fantastic giveaway! 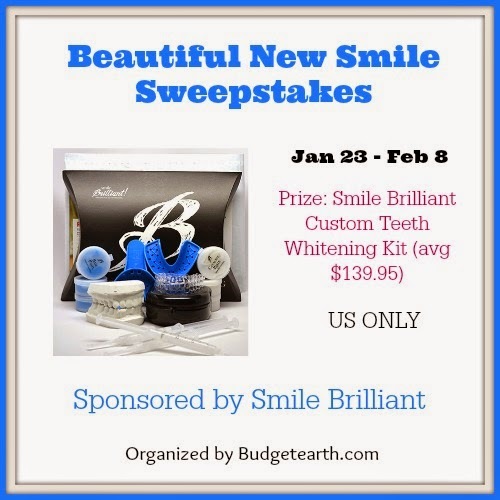 One of our lucky readers will win a Smile Brilliant Custom Teeth Whitening Kit (avg $139.99). To learn more, make sure to read the rules below and enter through the Rafflecopter! HAVE A Terrific 2015 & GOOD LUCK! Disclosure: This blog did not receive compensation for this giveaway. Facebook, Twitter, & Pinterest are in no way associated with this sweepstakes. Prize fulfillment will be handled by Budget Earth. Disclosure of Material Connection: I have not received any compensation for writing this post. I have no material connection to the brands, products, or services mentioned. I am disclosing this in accordance with the Federal Trade Commission's 16 CFR, Part 255: "Guides Concerning the Use of Endorsements and Testimonials in Advertising." I've wanted to whiten my teeth for a long time, I have to look into this! I've been wanting to try this product. Good luck to everyone joining! This teeth whitening system looks like a great product for everyone who needs beautiful white teeth naturally. The sweepstakes is simply awesome & I am going to give a try for sure. Thanks for sharing. What a great giveaway- I could really use this! Thanks for the chance to win! What an awesome giveaway! Looks like a wonderful system! This looks great! I normally hate whitening systems because I get goo all in my mouth. This looks that wouldn't be a problem, though! Smile Brlliant is a great company, I've review them before with the smaller thing they had. But I just won this on another site, I sent in my impressions waiting to get those back. I've used this before and was very happy with the results! It definitely worked well! Sounds like an amazing giveaway! Having super white teeth is something I work hard in doing but I would love to try this out. Thanks for the chance. This teeth whitening kit looks great. Having a great smile is so important. Thanks for running the giveaway! I have never heard of this before, but it looks like a really cool product! Unfortunately my teeth are no longer my own so I don't have to worry about whiter teeth! For those of you lucky enough to have all of yours this is a great money saver! I need my teeth whitened. However, I think I need to go to a professional as I tried it once at home and the process did not go as planned. I haven't used this product yet but I did get the kit in and I'm excited to give it a try. Thanks for the chance to win. I want a whiter smile. Such a great whitening system from the sound of it. I've ready to get my "white" on. Thanks so much for sharing and for the giveaway. This sounds like a cool product! I want whiter teeth. Wow…I didn't know that Smile Brilliant offers a risk-free guarantee with the purchase of their product. Very cool that they use a custom fit process. Looks like a great package for an awesome white teeth. And what's good is they offer it risk-free! however remember that your sensitivity can seemingly increase once more throughout or when the treatment, thus I counsel selecting a middle strength change of color gel wherever you'll take away it quickly if discomfort gets unendurable, for more information click here dentist jupiter. Thank you for taking a moment to comment ... It is appreciated! Growing up on three continents has exposed me to people/places that are culturally rich and varied. My interests in learning, teaching and traveling continue to inform my work as a training specialist. I enjoy visiting other bloggers websites and encouraging them. Unless we reach out and connect with other writers regularly, blogging can be a somewhat lonely endeavor. My family, friends, faith and colleagues have been instrumental to my growth as a writer/blogger. over the years, I've learned a lot and, as I continue to master my craft and learn new skills, I always remember to be grateful. Most importantly, I remember to support others. For several years, I signed off with eof777 - an abbreviation of my longer full name and love of aeronautics - Elizabeth Obih-Frank and the 777 series. Recently, I decided to simplify and now use the shorter - Eliz Frank. I'm a NaNoWrimo Winner 2009-2013!